One of the benefits of writing about these vintage drag bikes, is that a few people are beginning to contact me with pictures and info on early racers they know about. Recently I have had a couple of such contacts; one with the son of a famous '50s era racer, and another from a reader that owns a 50's era racer. This post is about the latter. 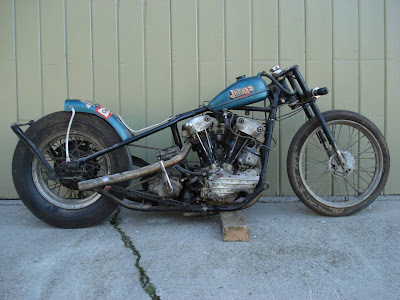 Ron first contacted me by phone some time ago, and told me about a Knuckle drag bike that he had acquired. Now he has sent me some pictures and agreed that it would be worth a shot for me to write about it in the hope that someone would be able to provide more info on the bike. The info Ron has is pretty sketchy. 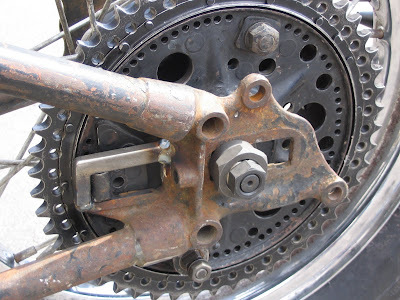 The bike was apparently found in the back of a machine shop in West Virginia where it had languished for the last 30 years or so. As the story goes, the owner of the machine shop, someone known as "Little John", was also the owner/builder of the bike. That is about all Ron knows of its history, since the bike passed through several hands between when it was sold at auction less than a year ago, and his acquisition of it. Let me tell you though, it is an absolute jewel (albeit a jewel in the rough)! Ron's plans are to do a mechanical restoration of it, preserving the patina. A man after my own heart. So, if anyone out there can shed any light on this piece of history, please contact me so I can pass the info on to Ron. I find myself submersed in this nation's biggest and most popular religious holy day; Global Scam Day, more often referred to as Earth Day. Thinking about Earth day and its associated zombie like followers, brought to mind a small incident from a month or so back. I was in my full size GM (Government Motors) pickup truck with its gas guzzling 5.7 V8. On my way to work, I happened to find myself at a stoplight beside a little cracker box car which was all painted up in various shades of green. The signage on the car indicated that it was part of an "Eco Friendly" package delivery service. I can hardly describe how impressed I was with the obvious attempt to save the world from humanity. As a matter of fact, I was so impressed, that I decided to show my enthusiasm. For the duration of the red light, I continually gunned the 350 cubic inches of Detroit cast iron. And I don't just mean tapping the throttle. No, I mean gunning the engine as though I was in the staging lanes at a drag strip, ready to make a record attempt! I am sure the glass packs on my truck allowed the driver next to me to share in my jubilation. Some might even call it "noise pollution." Of course, after this show of braggadocio, there was no way to end it except in a haze of tire smoke as the light turned green. Chirping the tires as I banged second gear put a smile on my face that lasted most of the day. The smile ....partly from the adrenaline of using a big V8 the way it was meant to be used, and partly from the satisfaction of knowing that I had likely used up as many resources in my short tirade as my audience's Eco box would in the next several days! Yes, its official. The "period correct" drag bike now has a name. Thanks to all of you who left suggestions for a name. In the end, Paul, who was the first to submit a name, was the winner with his second suggestion. Paul, please email me at lee@leesspeedshop.com so I can arrange to send your prize. The name "The Knuckle Dragger" immediately caught my attention as soon as it was suggested. What I really like about the name is that it fits on a few different levels. First is the obvious. 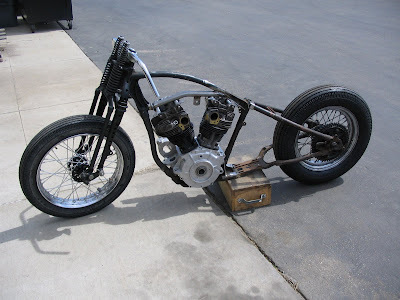 The bike is a Knucklehead and its use is for dragging. Secondly, since it is to be period correct for the 1950s, it will be simple (crude you might say, at least by today's standards) but with a lot of brute power. That kind of fits with the caricature I have in my mind of a Big ol' gorilla with its muscular arms so long that his knuckles literally do drag on the ground. The final reason that I like the name is the least obvious, but maybe the coolest. 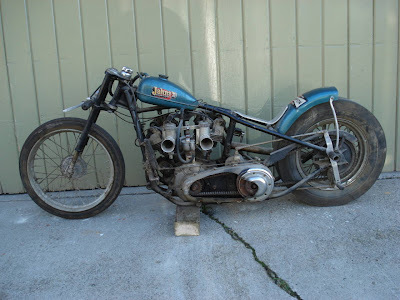 What got this whole ball rolling was my acquisition of some parts from Don Jone's 1950 Knuckle drag bike which was nicknamed "The Gorilla." Get it? Gorilla.... Knuckle Dragger. The fact that I will be using the original transmission from "The Gorilla" in "The Knuckle Dragger" kind of ties things all together and just somehow fits into my sense of honoring the pioneers of the sport. 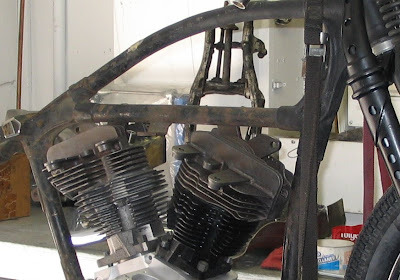 I just got the VL frame back from my good friend John at PMFR As can be seen in the above picture, the Knuckle motor does not fit in the VL frame without modifications. 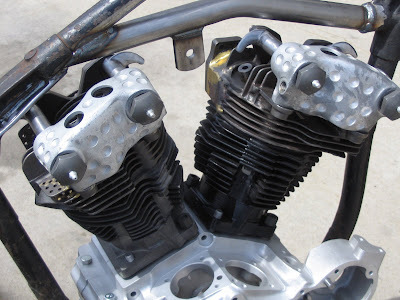 One frame tube runs right through where three of the rocker arms need to be. Luckily John is an absolute ace frame man. 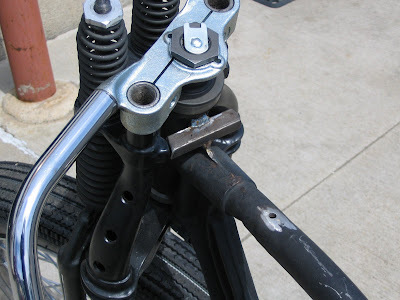 He fabbed a new tube to clear the rockers, as well as adding a fork stop, an anchor for the steering damper, some gussets to the rear motor mount, and modified the rear brake anchor to fit the FL wheel. John didn't use a TIG, because that weld would not have looked period correct. Cool, huh? It has been said that the resurrection of Jesus Christ is the most significant event in the history of the world. If you are a Christian, then you will probably agree with that assessment. Matthew 28:1-6 "In the end of the sabbath, as it began to dawn toward the first day of the week, came Mary Magdalene and the other Mary to see the sepulchre. And, behold, there was a great earthquake: for the angel of the Lord descended from heaven, and came and rolled back the stone from the door, and sat upon it. His countenance was like lightning, and his raiment white as snow: And for fear of him the keepers did shake, and became as dead men. And the angel answered and said unto the women, Fear not ye: for I know that ye seek Jesus, which was crucified. He is not here: for he is risen, as he said. Come, see the place where the Lord lay. " This is one the four separate accounts from the Gospels. It has also been said that the resurrection of Jesus Christ from the dead is one of the best documented events of ancient history. A miracle, to be sure, but not the only recorded instance of someone coming to life again after dieing. We have the case of Elijah raising the young boy from the dead in the Old Testament. You remember the story. Elijah had been staying with a woman and her son. She had only a handful of meal and little oil, but it miraculously never ran out. Eventually the boy took sick and died, but by the power of God, Elijah raised the boy back to life. Some years later, Elisha performed a similar miracle in raising a young boy who had died from a head injury. Shortly before his own resurrection, Jesus himself brought his friend Lazarus back to life. Lazarus had been ill, and Jesus seemingly "dragged his feet" in going to him on his sickbed, where his disciples apparently expected a healing to occur. Instead they arrived after Lazarus had been dead for long enough that as it is described in the KJV "he stinketh." If, then, the resurrection of Jesus Christ was not a unique event in history, why do so many claim that it was the most significant? For that answer we have to understand the significance of his death. The death of Jesus Christ was not significant because of his death on a cross, for many men were crucified in Jesus day. No, Jesus death on the cross was significant because of who he was and why he was being killed. Christ Jesus is that spotless lamb of God who was slaughtered as a payment for our sins. During the crucifixion, God the father poured out his wrath on his beloved Son just as though it was he that had committed all of our sins. That is what makes the resurrection of Christ so important. It is the proof given to all of us that his suffering and death was an acceptable payment for our sins. But there is one more piece of information that we may be overlooking as to why the suffering, death and resurrection of Jesus Christ is the most significant event in history. Sin! Sin is the reason that the suffering, death, burial and resurrection of Jesus Christ had to take place. The reason for the event is often passed over lightly, or even ignored. The term "sin" will likely evoke one of several responses when it is brought up. Some will be indifferent to the term "sin", seeing it as an archaic concept, with no relationship to modern life. Others will find the mention of sin to be uncomfortable or even offensive. Immediately they will feel that they are being judged. And for a few, the mention of sin will bring conviction. There is a fine line between the latter two. The source of the emotions may be the same (the conscience) but the results are a world apart. Few, it seems, have much idea what the origins of this word "sin" is. The words that are translated as "sin" in the Bible mean to "miss" or "to fall short." That doesn't sound so serious now, does it? And it wouldn't be, if it were man's standards that we were falling short of. But that is not the case. Taking sin "lightly" is a result of taking God lightly. It is a result of a lack of understanding the holiness of God. Until you start to get a glimpse of God's holiness, none of this "suffering, death, burial, and resurrection" of Jesus Christ can be of much meaning to you. because "sin " will not have much meaning to you. Every place in the Bible that we see a man get a glimpse of God's holiness, we see them taking it very seriously. Isaiah fell to his face and despaired that he was a man of unclean lips. Upon seeing "the appearance of the likeness of the glory of the Lord," Ezekiel fell on his face. John says in the book of Revelation, that when he saw Christ in his glory, he fell at his feet as dead. If you do not take sin seriously, then it is because you have no grasp of the holiness or the glory of God. The Bible teaches us that we are all sinners, and for some of us that fact is a comfort of sorts. "We're all in this boat together, so its no big deal if I am a sinner" But the truth is, God does not deal with us as a group with respect to sin. He deals with us as individuals. Did you notice how those commandments began with the pronoun "thou." Thou is singular. It means you as an individual. If God had meant the commandments to apply to us as a group, he would have said "ye." I believe that standing before God on judgment day will be a very lonely place. Just you and your sin in front of a God that is Holy. Lonely, that is, unless you have an advocate. One to stand up for you and say "he is guilty, but I have paid the price for his falling short. I have lived a life in which I never fell short of God the Father's expectations even once, and I did it in this sinners place. I have purchased him with the price of my blood. He is mine." Yes, the judgment will be a very lonely place for many, but not so if you belong to Jesus! If you belong to Jesus, then his resurrection is the most significant event in history! It is your proof that his suffering and death on the cross as a payment for your sins is acceptable to God.